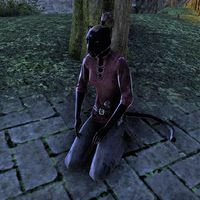 Cleverclaws is a Khajiit beggar who can be found in Haven. You'll find her on the east side of town, mostly at a small camp east of Horses' Haven. She has no unique dialogue. This page was last modified on 18 July 2018, at 02:11.